In general, back pain isn’t caused from a traumatic injury. It is caused by a strain in the muscles in your back and can be extremely uncomfortable and painful. 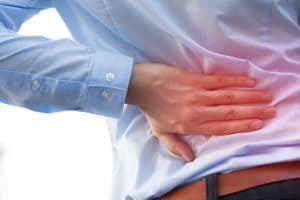 To strain these muscles there is generally a muscle or joint that is abnormally tight, muscle weakness, or the force of the injury may have been more than your body could handle which causes the back pain. Sitting is a common cause of back pain. The spine places itself into a rounded position and it ends up stuck there when you are sitting for hours on end, working at your computer or in a meeting. People with office jobs generally end up with more lower back pain than the rest of the population. Sleeping is another big cause of lower back pain. If you sleep on your stomach or your back you’re bound to wake up with a stiff lower back after a night’s sleep. Your spine tends to flatten, which causes stiffness in your back upon waking. You will also find this is coupled with neck pain as your head is always turned to one side or the other when asleep. Visiting a chiropractor is the best way to alleviate any back pain you may be feeling. As experts in their field, the professionals at Our Chiro, are specially trained to deal with all areas of diagnosis and treatment, ensuring you are free of pain in no time. They use safe, gentle techniques that are tailored to each and every client to make sure you are getting the most out of each visit.